Blacknight's founder and CEO, Michele Neylon, has been reelected for a third and final term as Chair of the Registrar Stakeholder Group within ICANN. Michele Neylon, CEO of Blacknight, Ireland’s leading domain registrar and hosting company has been reelected for a third and final term as Chair of the Registrar Stakeholder Group of ICANN (Internet Corporation for Assigned Names and Numbers). The Registrar Stakeholder Group (RSG) is one of several Stakeholder Groups within the ICANN community and is the representative body of domain name registrars. It is a diverse and active group that works to ensure the interests of Registrars and their customers are effectively advanced. The chair, in consultation with the executive committee and members, organizes the work of the Stakeholder Group and conducts RrSG meetings. The chair often confers with others in the ICANN community on Registrar-related policy and business issues, and is the primary point of contact between the RrSG and ICANN staff. 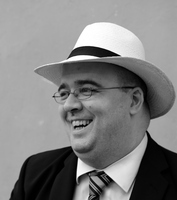 Neylon has previously served as the Secretary to the RrSG and is the only European member of the executive committee. Since the formation of ICANN, the Registrar Stakeholder Group has been the voice and advocacy organization for Registrars and their customers and has played a very active role in policy development and other ICANN processes. The other members of the executive committee are: Vice Chair Jennifer Standiford (Web.com), Treasurer Paul Goldstone (DomainIT), and Secretary Darcy Southwell (Endurance International Group) .